Every time I see my friends, my hands say hello! Repeat with different body parts. 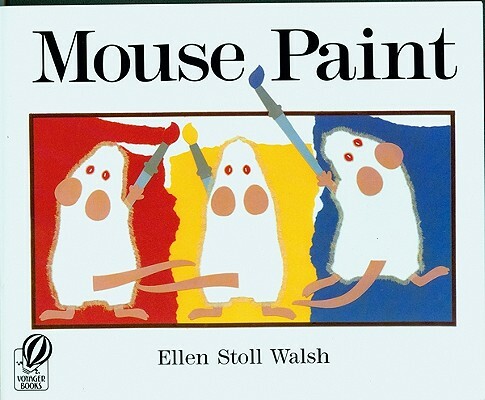 Book: Mouse Paint by Ellen Walsh - None of the classes I visited had seen this book before and they loved it! 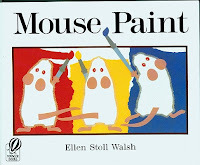 It's simply enough to read with young children, but older children get a kick out of guessing which colors the mice are going to make when they combine red and yellow, yellow and blue, and blue and red. Repeat with different colors and motions. This is a simple song/activity to do and the kids love looking all over their clothing for different colors. When I've done several colors and everyone's had the opportunity to stand up at least once, I ask the kids if I got all the colors, are there other colors we should do? They can always think of one I haven't done! 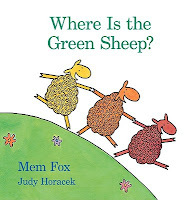 Big Book: Where is the Green Sheep? by Mem Fox - I love this book and I was so happy that the kids loved it, too! The funniest was the first class. Every time I got to the part that asked "Where is the green sheep?" they chorused, "We don't KNOW!!!" Wave your scarves in the MIDDLE! Then I asked kids with particular colors to wave. After I called each color, I asked them all to wave their scarves fast, slow, high, low, in front, behind, in a circle, up and down... And for the grand finale, we counted to three and then threw our scarves up in the air and watched them all come down in a big rainbow. 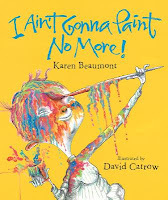 Book: I Ain't Gonna Paint No More by Karen Beaumont - I love to sing this book. I emphasize the rhymes and usually the kids can guess which body part the boy's going to paint next. 10 little fingers, we raise them up to the sky! 10 little fingers, we wave them all goodbye! I don't do a craft with these outreach storytimes, so then it was time to pack up and go back to the library! If you don't like or don't have any of these books, there are tons of alternate books available. When I go on an outreach visit, I always bring a few extra books just in case one flops or I run through everything and have time left.